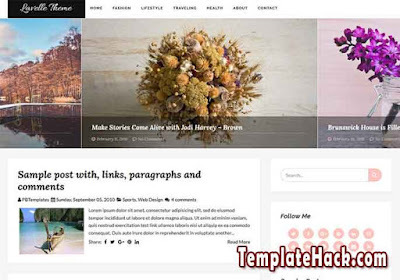 TemplateHack.com - Download Lavelle premium blogger template. Lavelle is a unique fashion blogger template. It is made with high quality design and clean typography to make your blog look sweetly. Lavelle theme made with big featured post placed on slideshow on the top of page. It is also has 2 column and social share button can you use to share every post to social media easily. Get the Lavelle blogger template by following the download button here. Browser Compatibility, Customizable, Drop Down Menu, Email Subscription Widget Ready, Featured Post, Girly, High CTR, HTML5 Valid, Mobile Friendly, Page Navigation Menu, Post Thumbnails, Responsive, SEO Friendly, Slideshow, Slider, Social Bookmark Ready, Social Share Button, Stylish, Typograhpy, Whatsapp Sharing Button, Minimalist, Simple, Unique, 1 Right Sidebar, White, Multicolors, 2 Columns. Beauty blogger template, Entertainment blogger template, Fashion blogger template, Food blogger template, Gallery blogger template, Lifestyle blogger template, Magazine blogger template, OOTD blogger template, Personal blogger template, Photo blogger template, Photography blogger template, Reviews blogger template, Travel blogger template, Viral blogger template, Wallpaper blogger template.